One of the most important aspects as far as maintaining tree health is concerned is proper tree pruning. At Port Orange Tree Service we are experts at performing this task. Our highly skilled and highly trained technicians will use the latest and best methods to leave your trees in a healthy condition and looking great when we are done. Tree pruning service is a lot like cutting your lawn; it is something that needs to be done on a routine basis to keep the trees on your property healthy and looking great. Unkempt trees are easily spotted and can really take away from the overall beauty of your landscape. Why do trees need to be pruned? One factor is that the Volusia County climate is very conducive to rapid tree growth; abundant sunshine and plenty of moisture are ideal conditions for tree growth. Unfortunately, tree pruning is not as easy as mowing your lawn and it takes special equipment and know how to do it right. That is where we can help. We have expert arborists working for us that have the right knowledge and equipment to properly prune any species of tree that you have on your property. Aesthetics – Trees make any landscape look great when they are pruned properly. Pruning eliminates ugly looking dead branches and keeps the tree shaped properly and proportionate for its age. Safety – Of course safety is always a big consideration around your home or business and tree pruning can do such things as keep branches away from dangerous power lines and make sure there is a clear line of sight for such things as passing vehicles. Tree health – Unhealthy trees simply do not look good. Pruning goes a long way toward improving the overall health of the trees in your yard and the other plants and vegetation there as well. It lets vital sunlight and air flow through to all parts of the tree and to the other surrounding greenery in your yard. It takes a lot of knowledge to properly prune trees and that is why it is a job that is best left to professionals. Improper pruning will not only hurt the look of the trees on your property but it may also harm or even cause then to die. We have professional tree pruning experts in place to help you avoid potential problems with the vital pruning that your trees need. 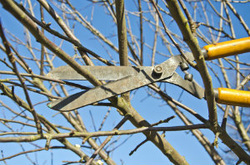 If possible, try to perform most of your pruning at times of the year when your trees are not growing. This way pruning will not affect their health as much. Try to prune only young branches and ones that are not fully developed yet. This will impact the health of the tree less. A good rule of thumb is to never prune branches that are 2” in diameter or more. Crown raising is great for tree clearance around such things as sidewalks and driveways but it is important to try and never remove branches in the top 2/3'rds of any tree's height. As you can see, proactive tree pruning is very important to maintain the health of the trees in your yard. The pros at Port Orange Tree Service are always ready to take care of any of your tree pruning needs. All our work is done to the highest of professional standards and done at competitive and fair pricing. To learn more about proper tree pruning techniques, which are vital to the health of your trees, click here. So call us today at 386-267-6399 for a free estimate. We provide our tree pruning service in Port Orange, FL, as well as other tree services like tree removal.